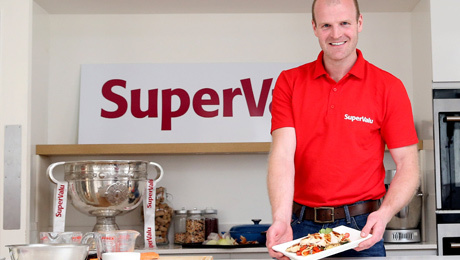 "My GAA Winning Taste of Summer is Chicken Noodle Salad - easy to make during a hectic training schedule and ideal for BBQs and picnics." Pour the oil into a glass bowl and add the lemon juice and zest. Add the chicken and sprinkle with the chopped coriander. Allow to marinade for 30 minutes if possible. Place a griddle pan over a medium heat and add the marinated chicken fillets, cook for 6 – 8 minutes each side, depending on thickness. Meanwhile prepare the noodle salad. Blanch and refresh the noodles. Preheat a wok, and drizzle 1 tbsp of sunflower oil, add the vegetables and Stir-fry for 2-3 minutes until warmed and softened slightly but still retaining their colour and slightly crisp. Season with salt and pepper. Allow the vegetable mixture to cool down completely. Mix the vegetables into the blanched and refreshed noodles. Stir in the chilli jam and rice vinegar and Season accordingly. To serve, divide the noodle salad between 4 plates and add the sliced chicken on top. Sprinkle with some fresh coriander if desired. Serve immediately. Also more commonly known as “Pan Seared Chicken Noodle Salad”! Take a picture of your attempt and share using #SVwinningtaste or enter online to be in with a chance of winning great prizes!